The Piney River Mini Triathlon is intended for anyone interested in fitness, althletic competition or just healthy exercise. Participate and support the Blue Ridge Rail Trail, the Rescue Squad and our sponsors. Nelson Co. Recreation Dept. Do it for fitness. Do it for fun. Do it solo. Do it as a team. But Just DO IT! Fee: $20 solo; $35 team of 2; $45 team of 3 or 4; $45 for family (mom, dad, kids). NOTE: T-Shirts are free for ages 12 and under. Otherwise T-shirts are $10 each. T-shirts are guaranteed if ordered before March 22. After that date remaining T-Shirts will be sold on a first-come, first-served basis.. Lunch: There are several good restaurants and delis in Lovingston, Colleen and Amherst in addition to numerous restaurants at local wineries, breweries, distilleries and cideries in and near Wintergreen Resort. Try out our local cuisine or bring your own. Triathletes are encouraged to bring water or other non-alcoholic, liquid refreshment and snacks as desired. 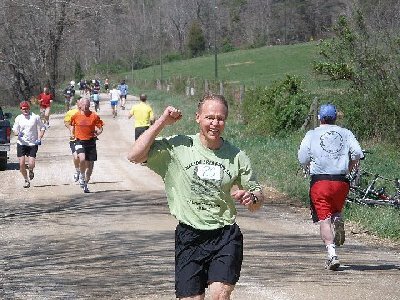 Run 1.6 miles alongside the beautiful Piney River. Paddle 3/4 mile on the Piney's Class I - II rapids. Bike 2.5 miles - 3/4 mile up Old Rose Mill Road alongside the Piney River and 1.75 miles up the Blue Ridge Railway Trail. Registration: 9:00 - 11:00 AM at the race start location. Finish: Virginia Blue Ridge Railway Park Trail Head on Rt. 151. Award Ceremony: will begin at 1:15 PM at the trail head. Awards: for 1st, 2nd and 3rd place finishers. Team - All Male, All Female, Coed. James River State Park has a variety of camping arrangements including primitive camping alongside the river. Register for the triathlon at the Virginia Blue Ridge Railway Trail lower parking lot off Rose Mill Rd. Take your boat to the Put-In under the bridge. Take your bicycle to the paddle Take-Out. 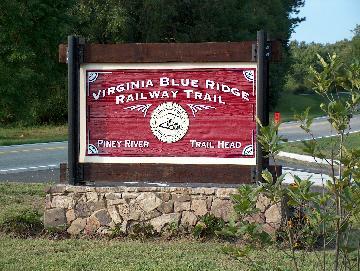 Park your vehicle at the Virginia Blue Ridge Railway Trail upper parking lot off Route 151. You can take a shuttle or walk down the trail to the Run Start on Rt. 674 (registration area). (see map and directions below). The race will begin with a mass start of the runners at the Run Start on Rt. 674 at the registration area. Runners will follow Rt. 674 north, across the Piney River to Rt. 665. They will turn right onto Rt. 665 and follow it to the paddle Take-Out. They will then turn around and run back to the paddle Put-In. 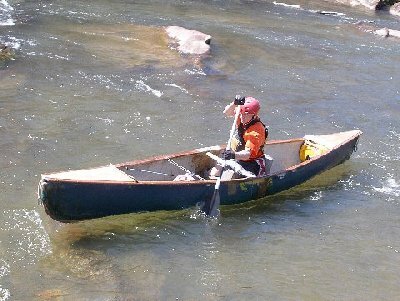 After runners reach the "Put-In" they will get in their canoe/kayak or exchange with the paddler, then paddle to the Take-Out. After paddlers reach the "Take-Out" they will get their bike or exchange with the cyclist, then ride up Rt. 665 to Rt. 674. Cyclists will then turn left onto Rt. 674 and follow it to the Blue Ridge Railway Trail. They will turn right onto the trail and ride it to the finish line at the trail head. Note: The race course may not be suitable for racing and road bikes although the most competitive triathletes often use these types of bikes. Mountain bikes should have no difficulties. Cyclists on comfort bikes or hybrid bikes will need to exercise caution as the trail is often rough in places. Take Rt. 29 South from Charlottesville to Rt. 56 West at Colleen. Turn right (West) onto Rt. 56. Proceed 5 miles to Rt. 151. Turn left (South) onto Rt. 151. Proceed 2 miles to Park on left. Take Rt. 29 North from Lynchburg, past Amherst to Rt. 151. Turn left onto Rt. 151. Proceed 7 miles to Park on right. Proceed 4 miles to Rose Mill Rd (Rte 674). Turn right at Excel Station onto Athlone Lane. Proceed 4.5 miles to Race start. • All paddlers must wear Coast Guard approved life vests. • All participants are required to give aid to any other participant in danger. • Bicyclists are required to wear helmets for their protection. • Paddlers are strongly encouraged to wear whitewater helmets for their protection. • No runner, paddler or cyclist may interfere with or impede the progress of another. Cyclists should stay to the right to allow faster cyclists to pass on the left. • Triathletes are encouraged to run the race course sometime before the actual race and to scout rapids. • Triathletes may make appeals to race officials but, in all cases, the decision of race officials is final and binding. Consider Camping and Picnicing at the James River State Park (1-800-933-PARK ). Race time is at 11:30 AM. Those who wish to do a practice run early may do so. Connect to www.NelsonCountyVA.org for more information about accommodations and sites to see in Nelson County. A detailed course map is located here. X marks the trail head. Major road access is in yellow.